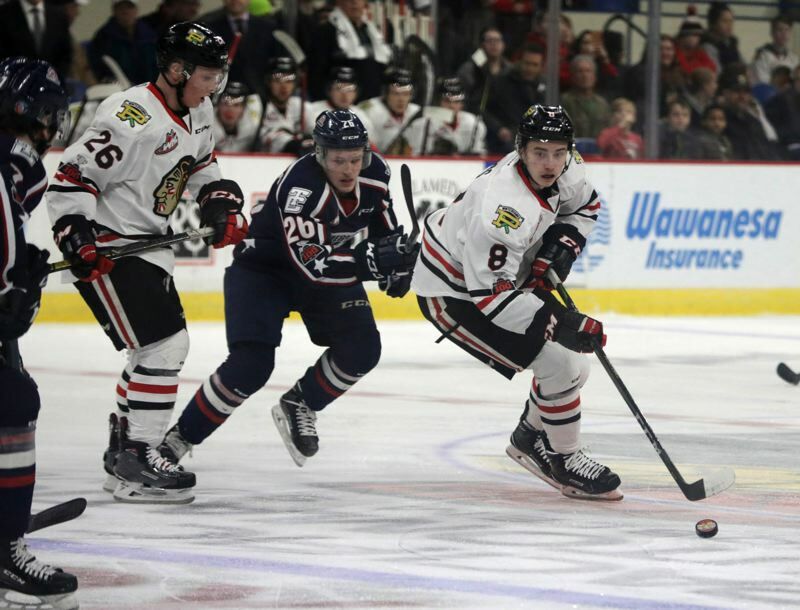 The Tri-City Americans scored three quick goals midway through the third period on Wednesday and beat the Portland Winterhawks 6-3 in front of 5,719 fans at Memorial Coliseum. The fourth consecutive Western Hockey League win for Tri-City (19-10-3-1, 41 points) moved the Americans within two points of the Winterhawks (21-12-0-1, 43 points. It was Portland's third loss in a row, and the Hawks fell to 4-7 in games this season at Memorial Coliseum. Cody Glass scored twice for Portland, Jake Gricius had a goal and the Hawks outshot the Americans, 33-25. The game turned during a 3:01 stretch of the third period. Morgan Geekie scored on an up-ice rush 6:29 into the third period to break a 3-3 tie. Dylan Coghlan made the score 5-3 just 48 seconds later. A kick save by Portland goalie Cole Kehler went right to Coghlan. Nolan Yaremko made it a 6-3 game 9:30 into the third period, cashing in a turnover at the end of some forecheck time for Tri-City. Yaremko and Geekie each finished with one goal and three assists for the Americans. Glass' second goal of the night and 22nd of the season came on a second-period power play to give the Winterhawks a 3-2 lead. The goal came seconds after a five-on-three advantage expired and ended a stretch of six games without a power-play goal. Tri-City got that one back when Johnson was on the spot to put in a rebound chance after Kehler made a save on a Yaremko shot. Tri-City took a 2-0 lead on goals from Johnson and Kyle Olson. Goals 28 seconds apart from Glass and Gricius for Portland tied the score at 2-2. Tri-City goalie Beck Warm finished with 30 saves, among them a couple of close-range stops against Glass and against Skyler McKenzie. Kehler had with 19 saves. The first game back from Christmas break was the first of four in five nights for the Winterhawks. Portland is at Tri-City on Friday and at Seattle on Saturday before playing host to Seattle on Sunday for the annual New Year's Eve game at Moda Center. • On Wednesday, the Winterhawks traded 17-year-old forward Brad Ginnell to the Kootenay Ice for a second-round pick in the 2018 bantam draft and a third-round pick in the 2019 bantam draft. • The Hawks are without Kieffer Bellows (USA), Henri Jokiharju (Finland) and Joachim Blichfeld (Denmark), who are at the World Juniors tournament in Buffalo, New York. Tri-City defenseman Juuso Valimaki is with Finland at the World Juniors. Americans forward Michael Rasmussen did not play on Wednesday.